When looking for a hotel in Florida – you’ve got to think about your itinerary. Do you want to be near theme parks? Beaches? Adventure zones? A mix of all three? We recently flew into the Sanford Orlando International Airport via a direct flight from Omaha with Allegiant. It was going to be a quick weekend Florida getaway. 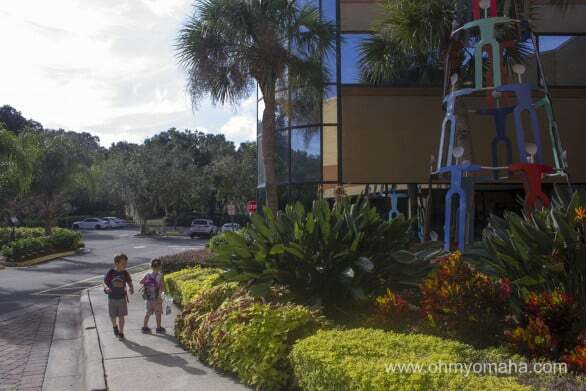 We needed a centrally-located hotel that could make it easy for us to get to attractions like the Central Florida Zoo and airboat rides at Black Hammock, as well as a quick hop onto the interstate to get to a beach. Knowing our priorities (along with acknowledging a lot of visiting families want proximity to major theme parks in Orlando), Seminole County suggested we stay at the Hilton Altamonte Springs. 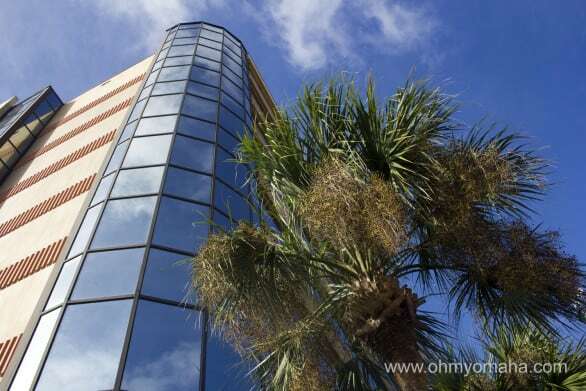 The location was convenient and within a mile of Interstate 4. It was also near many dining options, a movie theater, shops and, for the parent who needs it, a wine store. 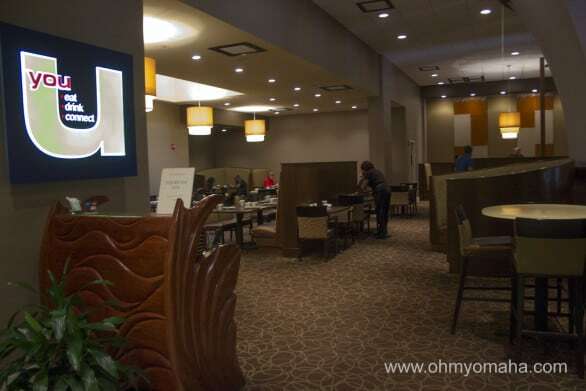 We stayed at the Hilton in Altamonte Springs, located between Orlando and the Orlando Sanford International Airport. 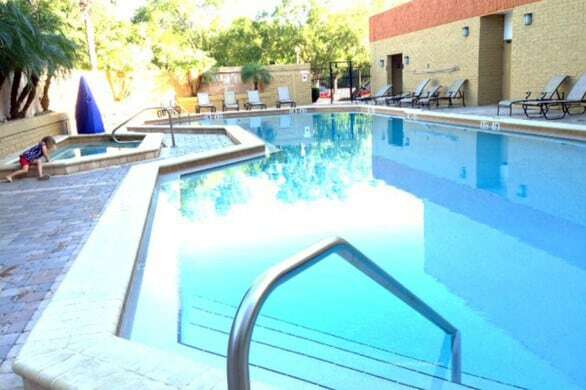 It also had an outdoor pool and hot tub – a major plus for my kids, as well as a couple dining options for the family. Like your coffee? They serve Starbucks there. The same counter has a grill, or if you need a cold treat, there’s an ice cream case full of tasty offerings. The lobby of the Hilton had a cafe that served Starbucks coffee, as well as a grilled burgers and a much-needed cooler full of ice cream treats. We tried out the breakfast buffet one morning. If you’re a Hilton Honors member, the buffet is included with your stay each morning (or a reduced cost entree from the menu). The entrance to the dining room at the Hilton Altamonte Springs in Central Florida. Hiltons are known for comfort and the one in Altamonte Springs was pretty comfortable. Nothing beats a Hilton pillow. And the beds were the most crisply made beds I’ve ever encountered – they don’t get more tucked in than the do there. Another bonus for us were the blackout curtains, which helped our kids get a full night’s sleep without the Florida sun waking them early. The toiletries provided were high end. Everyone we encountered at the Hilton was friendly. We arrived very late on our first night and the evening clerk was prompt and cheerful. We were warmly greeted by housekeeping, restaurant staff, and front desk clerks. A special shout out to Keith, who took the time to read my Florida bucket list post and left us a local’s guide to checking off some of it – including brochures, restaurant suggestions and a couple oranges. It was very thoughtful and helpful! Outdoor pool time in November? Yes, please. All my kids are about is the pool at a hotel. If they had their way, it’d be the only thing we visit while on vacation. The Hilton’s pool stays open until 10 p.m. We swam before dinner one night (you could get takeout and have it at one of the tables on the pool deck). We had the pool and hot tub to ourselves for most of our swim. The only downside to the pool area was the steady hum of the interstate. While I count the hotel’s proximity to it as being a perk for getting around, there’s no escaping the sound of it, even with high privacy walls. 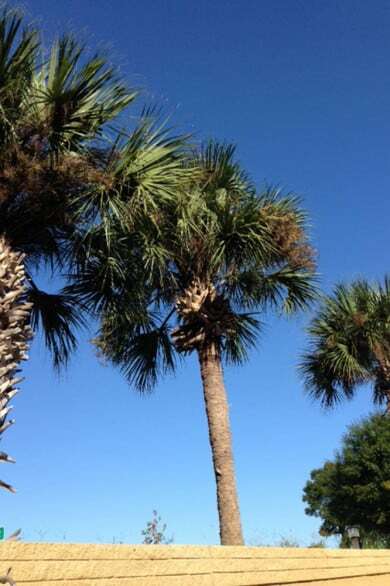 The quintessential Florida view beyond the pool’s privacy walls. The kids never noticed. It’s only if you’re trying to unwind in the glorious hot tub and you were seeking some quiet time do you notice it. But, if you’re reading this, you’re a parent and you never get quiet time. Disclaimer: A special thanks goes to Seminole County for hosting our Florida adventure. All thoughts and opinions are my own.